As the current academic year starts to wind down (ha! ), my thoughts inevitably turn towards planning for next year. For my KS3 classes, this might involve refreshing existing units. But, as we’re still only halfway through teaching the new specifications for GCSE and A-level, I’ll definitely need to spend time creating resources for my examination classes. Thankfully, this doesn’t have to be as time-consuming as it sounds. In fact, I’m pretty sure I’ll be sorted before the summer holidays. What’s the secret? Knowing where to look for support. With the new Year 10 and 12 courses in the bag, I can now turn my attention to those for Years 11 and 13. When writing a new scheme of work, there are a handful of things I always aim to do. Firstly, I make sure I have the specification next to me. Sometimes, student-friendly versions can be easier to digest. I also find it helps to have a copy of each of the textbooks published for that specification, just so I can be sure I’ve covered everything. To keep planning focused, I find it useful to include a slide detailing the part of the specification we’re covering at the beginning of each lesson presentation. This GCSE climate change unit takes things one step further by including the learning objective on almost every slide, while this short scheme on rivers offers success criteria based on different grade boundaries, ensuring all learners know what to aim for from the start. To end up with something as comprehensive and engaging as this A-level unit on diverse places, I find that research is key. As well as checking out web-based forums in which teachers are discussing and sharing resources, I also participate in the online training offered by exam boards. Investing time in this gives me confidence that I’m on the right lines with my own planning. For the new AQA GCSE Geography specification (teaching beginning Sept 2016, first examination Summer 2018). This breaks down the course for students to follow and can be used a huge range of ways. It has each section linked to pages in the CGP Geography AQA revision guide (full version, including exam questions). 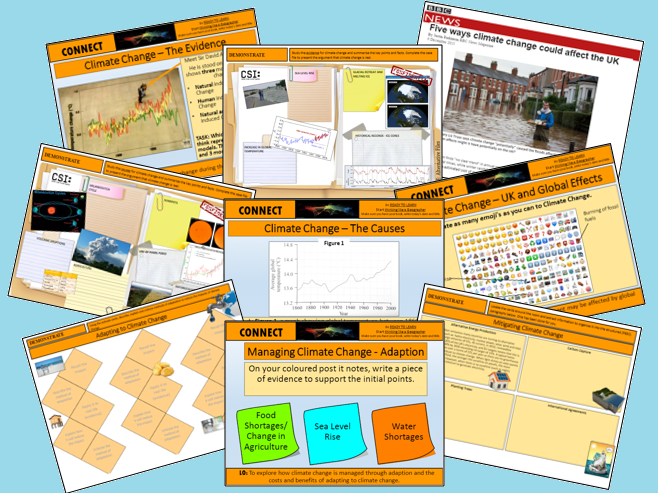 Full SoW for GCSE Geography AQA A new 9-1 specification (Sep 2016 onwards) for Climate Change. It has been devised using existing lessons and new GCSE Geography 9-1 textbooks as well as own knowledge. All powerPoints, videos and worksheets included. Lessons incorporate independent and group work and questioning and AfL. Some homework included but you may need to add some. Lessons also have model exam questions and mark schemes/model answers designed for new 9-1 GCSE. End of unit assessment is included. I hope you find it useful and valuable. New AQA specification. Complete set of lessons which teach students about rivers. The set of lessons follows on from the coastal SOW, which can also be found on my TES account. The video for the lesson on the River Tees is available on YouTube. Like most teachers, I pledge to be more organised and efficient every year. One of my biggest successes was the creation of dedicated homework booklets for each year group. These save me precious minutes rifling through exercise books looking for specific tasks to mark. Homework booklets lend themselves well to consolidating learning at KS3, especially when it comes to practising key skills such as analysing maps. But they can also work for your exam classes too. This workbook on coasts is structured in such a way that it can be useful for revision later on in the year. A map skills homework booklet for use with KS3 Geography classes. An amalgamation of worksheets I have gathered over the years to create a comprehensive and easy to mark Map Skills Homework Booklet! This is a booklet covering the whole of the coastal zone with questions, gap fills, illustration etc activities to be used as homework or revision.